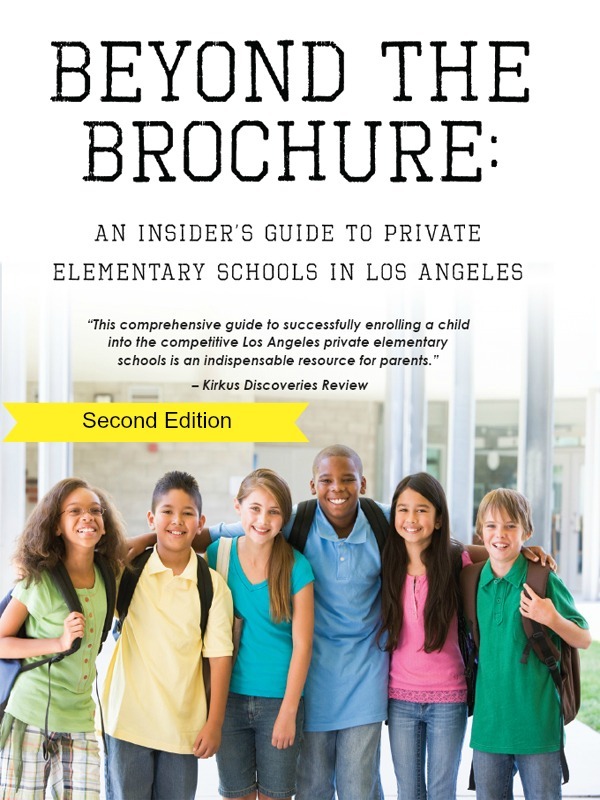 Beyond The Brochure: An Insider’s Guide To Private Elementary Schools in Los Angeles (Second Edition) is a book written for parents who are about to embark on the ultra competitive process of applying to private elementary schools in Los Angeles. Written by Christina Simon, Anne Simon, and Porcha Dodson. Published in November 2013 by Fat Envelope Publishing. Who better to write a one-of-a-kind insider’s guide to private elementary school admissions in L.A. than a head of school with more than thirty years experience in L.A. and nationally, a teacher who spent five years at a prestigious Bel Air private school and a parent of two children who currently attend a top L.A. private elementary school? Beyond The Brochure: An Insider’s Guide to Private Elementary Schools In Los Angeles Second Edition is written by Christina Simon, Anne Simon and Porcha Dodson, who together are uniquely qualified to help parents navigate the competitive and stressful race to get their children into top private elementary schools in L.A. Written in a warm, friendly tone, the authors guide parents step by step through the process for applying to schools. With far more applicants than available spaces, applying for a spot at the top schools can frazzle the nerves of even the most laid back parents. The book provides a revealing glimpse into private elementary schools in LA and what it takes to get in. We share our own experiences and demystify the ways in which these schools assess parents and their children during those nerve-racking interviews, as well as how schools provide financial aid and seek diversity. 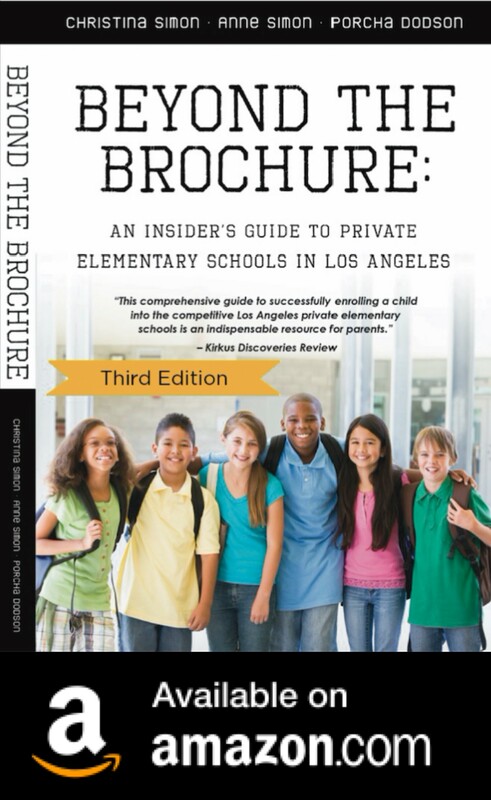 Beyond The Brochure: An Insider’s Guide To Private Elementary Schools in Los Angeles Second Edition provides a detailed roadmap for parents to follow as they navigate through the paperwork, deadlines and personalities at private elementary schools. From how to decide which schools to tour, acing your parent interviews, preparing for your child’s testing day, writing the applications, applying for a child with special needs, how to apply for financial aid, what to expect during your first year at private school and much more. Beyond The Brochure: An Insider’s Guide To Private Elementary Schools In Los Angeles is an expert guide to help parents improve their chances of getting into the schools of their choice. Both reassuring and straightforward, this book offers techniques and strategies from the authors and other parents, all of whom have been through the admissions process–and succeeded in getting their children into the city’s best private schools. The Second Edition (November 2013) is updated and expanded from the First Edition published in 2009 and updated in 2010. The Second Edition (Nov. 2013) includes more sample written applications, more letters of recommendation, a new chapter about creating a Family Message, a new chapter about applying to Pasadena area schools and more!